Out of a small number of Vietnamese restaurants in El Paso, it turns out that two of them (Wicked Pho and Viet) are in proximity to each other, leading to inevitable comparisons between the two. While Viet is run by Vietnamese people (I know because I met the owner), several reviews of Wicked Pho say it is not (I cannot confirm this because I did not meet the owner). The menu of Wicked Pho indicated to me that the food is Asian fusion, as some reviews also state. 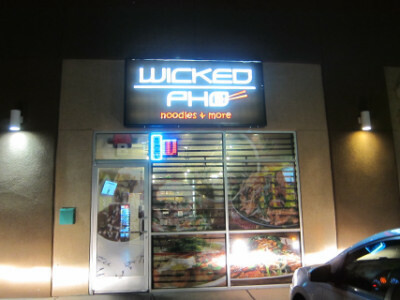 The reviews of Wicked Pho are varied, ranging from five stars to very low assessments of the food. Having tried three of their items, I found the range to be about three stars to five (not the very low ratings that some had given it). It does depend on what you order, though, because some menu items are clearly not Vietnamese. Also I did not try the pho, which seemed to be the object of most of the bad reviews. An obvious comparison with Viet Restaurant is that Wicked Pho has much fewer menu choices, particularly with Vietnamese items. Still, I liked what I ordered, and whether it is authentic or not I am glad I came. 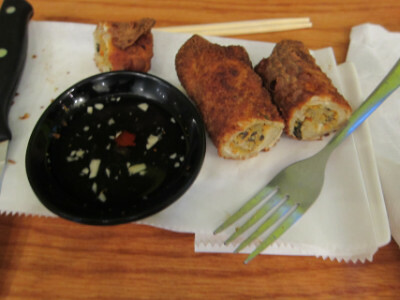 The Egg Rolls were standard for Asian restaurants, although I believe this is Americanized Asian food. The sauce did not have a flavor that stood out to me. For me a better appetizer was the Pan Seared Dumplings, which were similar to other very good ones I have had. I ordered the Lemongrass Grilled Pork Chop mainly because of having few options on the menu, but this was an excellent dish that so far is the best Vietnamese pork chop I have had in El Paso. The egg and garnishes were a definite enhancement, but the meat itself was quite good. 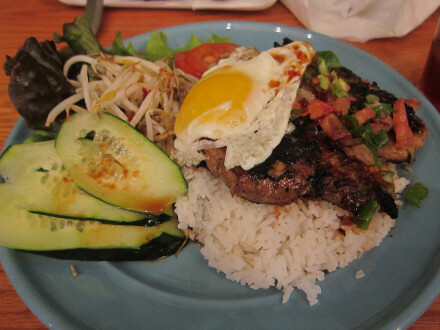 I also loved the lemongrass flavor, and I definitely recommend this as an upscale Asian food item (pork chops at any Vietnamese restaurant will be one of the most expensive items on the menu). I forgot to take notes about the tea and therefore do not have any information about it. There is a small Vietnamese menu here, but the pork chop was excellent. In contrast, many of the reviews of the pho do not make me want to try it. The pork chop here was actually better than ones I have tried at other restaurants (such as Saigon Taste on the west side), but the appetizers ranged from good to lackluster. This makes me think that the range of reviews from good to bad depends largely on what you order. It is hard to give an overall assessment of the restaurant, but the pork chop was memorable to me for how good it was. Although this restaurant has been here for a number of years, it changed its name sometime around the beginning of 2018 from Los Gallegos to Los Galleros. Some comments on other web sites indicate that it has spun off from the other Los Gallegos restaurants in town, and now has independent management. The decor of the restaurant and the menu, though, indicate that it is the same restaurant as before, serves the same food, and has the same specialties such as its special menu during the Lent season. One of the restaurant’s specialties is breakfast, and this is the reason I made my first visit after the name change. They had a large breakfast buffet which included scrambled eggs and the normal breakfast items. I did not spot Mexican dishes in the buffet, although it may be possible that they will serve them on request (I did not ask about this). I also noticed that tables were served chips and salsa as part of the meal. I ordered Huevos Rancheros from the menu, meaning that I could not get the “all you can eat” special from the buffet but this meal was very filling and extremely satisfying. 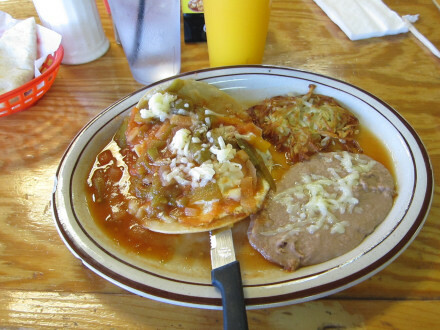 In addition to beans and hash browns, it had an excellent flour tortilla. This was one of the three or four breakfast specials they had, meaning that it was a very good price (mine was $3.99). I thought the huevos rancheros were excellent–they had a very good flavor and were spicy without exceeding the spice level that I thought was appropriate for this dish. The Hash Browns were very good (especially when compared to the ones at New Clock which I thought were greasy). The Beans were excellent and not greasy. A glass of Orange Juice I ordered at an extra charge was the only disappointing part of the meal, and something I would probably skip in the future (I believe they said you could order horchata for breakfast along with the standard drinks such as coffee, etc.). I happened to go on a Friday during Lent at the old Los Gallegos and discovered that this is one of the few places with an authentic comida de cuaresma (Lent special). I tried the Pescado Veracruzano (pollack with a tomato sauce, peppers, green olives, etc.) which was actually on the menu all the time. Although the fish was not very good quality the preparation was excellent, and I enjoyed the sauce and the side dishes including good old fashioned french fries. What made the Lent dinner unique were the lentejas (lentil soup) that was one of the best I’ve ever had and the capirotada (bread pudding) for dessert. I noticed a sign at the new Los Galleros that they still have Lent specials and it seems that this is still one of their specialties. I had a problem with some of the regular menu items at Los Gallegos, though (and hopefully this may be one area where the new “independent” restaurant may be different). For instance, the Chicken Mole had a pretty decent mole sauce, but the chicken meat was so tough you needed a knife to cut it. Tortilla Soup was served in a huge quantity such that the large bowl (for about $3) was enough for a meal at Los Gallegos. However the tortilla strips begin to disintegrate so that it became a soggy mess (another example of a dish which I hope is now improved at the new Los Galleros). Having a breakfast experience at Los Galleros may not be enough to give me a full picture of the overall food quality at the restaurant. However, it was very encouraging and much better than the meals I had before at Los Gallegos. 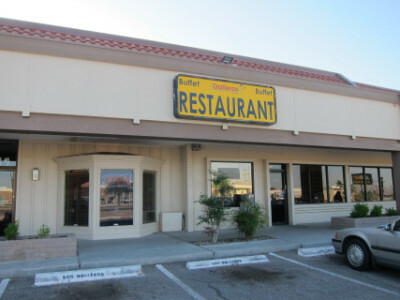 This, along with the good experiences I had at Los Gallegos (such as the Lent meals) makes me think that the owners had a purpose in changing the name and that they have retained the good features of the old restaurant while adding some new ones that customers will enjoy. With all of the items I eat and new dishes I like to try, sandwiches comprise a surprisingly small portion of this. It is not that I am averse to them, but I hold a high standard for what I like to eat (probably more than with other types of food). Chubby’s is worthwhile, though, serving Boar’s Head meat and other ingredients that are high quality. I have been eating Boar’s Head at home for a while, and I can vouch for its quality, flavor, and lack of the preservatives that nutritionists say we should avoid. It is more difficult for restaurants to serve this type of meat, with a small window of time that the meat will be fresh and not wanting to have too much of it that they have to throw away because it does not sell. 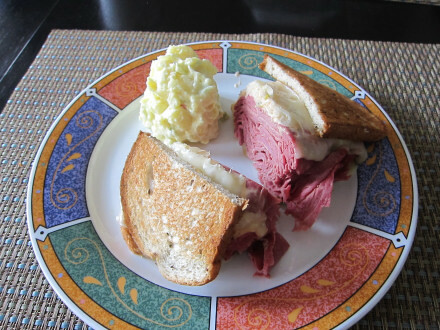 The Reuben sandwich seems to be the specialty of Chubby’s (I gathered that both with on line comments and from what employees were recommending). Although you can build your own sandwiches here, I think the standard reuben with sauerkraut and Russian dressing is a good bet. It is very fresh, and of course each person will judge whether or not it tastes good (but I thought it was pretty good considering that I generally like things like turkey or tuna). Although Chubby’s is very good, I find the choices limited for what I would expect in a deli. 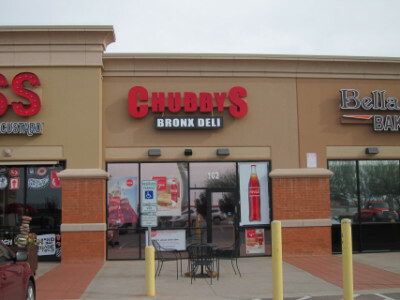 Some delis I know in Oklahoma prepare their own dishes in addition to the sandwiches, and I am not sure if Chubby’s is really a deli or whether it is just a sandwich shop. Yelp has reviews for their cheesesteak sandwiches and chicken salad, which take more preparation than merely throwing a sandwich together. Still, I think the choices are limited for a deli. Having said that, I cannot argue with the quality or flavor of what Chubby’s serves.